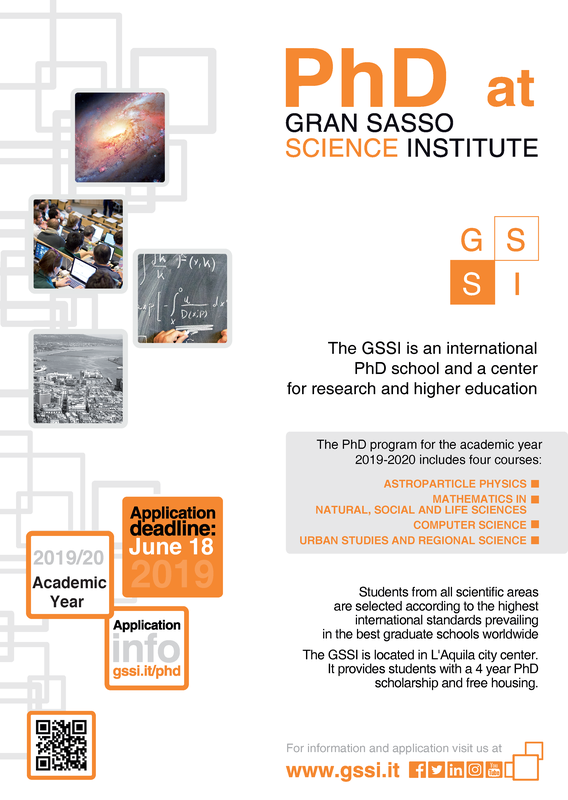 The application must be submitted through the online form available at www.gssi.it/phd/ by 18 June 2019 at 6 pm (Italian time zone, 6pm). The main aim of the curriculum in Astroparticle Physics is to provide the entrance points and the scientific and cultural tools to participate successfully to the researches in particle physics, nuclear physics, and astrophysics, high energy astrophysics, gravitation, and cosmology. A special attention will be given to experimental and phenomenological aspects. Moreover, the PhD student in Astroparticle Physics at GSSI will have a special opportunity to follow and participate to the research conducted at the Gran Sasso National Laboratories (LNGS), with its wide community of scientists from all over the world. The Astroparticle Physics curriculum consists of 4 years of study and research. The first year a wide choice of courses will cover a large spectrum of topics and the year will be concluded by a final exam. Students will work on a research project under the supervision of one or more teachers and scientists of the GSSI, of the INFN Gran Sasso National Laboratory and/or of the professors of the University of L'Aquila. Interdisciplinary approaches to the studies and research, exchanges of ideas and innovations are strongly encouraged. Felix Aharonian (Max Planck and DIAS), Roberto Aloisio (GSSI), Veniamin Berezinsky (GSSI), Pasquale Blasi (INAF and GSSI), Eugenio Coccia (GSSI), Fernando Ferroni (Universtà La Sapienza Roma and INFN), Stefano Ragazzi (Università Milano Bicocca and INFN), Guido Martinelli (Universtà La Sapienza Roma), Antonio Masiero (Università di Padova and INFN), Sergio Petrera (Università dell'Aquila and GSSI), Carlo Rubbia (GSSI and Max Planck), Francesco Vissani (Chair, LNGS and GSSI). The Gran Sasso Science Institute offers 34 Ph.D. fellowships in Physics, Mathematics, Computer Science and Social Sciences. The Gran Sasso Science Institute (GSSI), founded in 2012 in L’Aquila (Italy) as Center for Advanced Studies of the National Institute for Nuclear Physics (INFN) and then established in March 2016 as a School of Advanced Studies providing post-graduate education, offers 34 Ph.D. positions for the academic year 2018/19. The GSSI (www.gssi.it) invites applications for 10 fellowships in “Astroparticle Physics”, 8 in “Mathematics in Natural, Social and Life Sciences”, 8 in “Computer Science” and 8 in “Urban Studies and Regional Science”. The official language for all Ph.D. courses is English. The fellowships are awarded for 4 years and their yearly amount is € 16.159,91 gross. All Ph.D. students have free accommodation at the GSSI facilities and use of the canteen. The application must be submitted through the online form available at www.gssi.it/phd/ by June 20, 2018, at 18.00 (Italian time zone).